We don’t just care about your teeth, we care about your health! It’s true that most people don’t visit their family doctor very often. As a result health issues may go undetected. 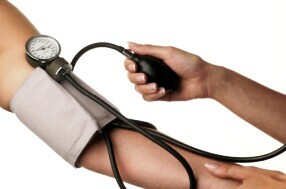 Our blood pressure screening is done with our computerized blood pressure monitor at your regular maintenance visits. Signs of high blood pressure include, headache, dizziness, pounding in ears, bloody nose. If you can just picture pressure in your head, then you can remember what the signs of High Blood Pressure are. You smoke – Cigarette smokers are at greater risk than pipe and cigar smokers, but all forms of tobacco are proven to be detrimental to the hearts health. You are overweight – Persons that have an excess of body fat are at a higher risk than persons of normal weight. Family History – Children of parents that developed heart disease before the age of 55 have a higher risk of developing heart disease. You exercise less than 30 minutes per day – Inactivity puts a person at higher risk of developing heart disease. You are over 40 or a post-menopausal woman – Risk of heart disease increases over the age of 45 in males, over 55 in females. Don’t leave your health up to chance! Call us at (513) 896-1573 to schedule a dental visit today and let us check to make sure your overall health is good.